I am calling it an intro because most of you looking at this already know I am so into Smooshy Nail Sunday that I can't just make a big deal about it once. I have some cool posts planned around my favorite day of the week but since this smoosh happened long before the blog went up, it's going to have to wait! I thought for today it would be fun to post my stamped smoosh in advance, tell you about Smooshy Nail Sunday in case you don't know about it yet, and to share some quick tips on how I get my smooshy nails just the way I like them. There are many ways to smoosh and none are wrong, but my favorite is the marbled smoosh and I get asked a lot how I get that look. I want to take the time to walk you guys through it, and hopefully that will be next week, maybe I'll even have a tutorial video! Hey, stop laughing! But seriously, for now here are some tips. I use my stamper to smoosh and I don't dab any more than five times ever! If you want your colors to blend, dab away, but if you like your smoosh colors to remain separate and only swirl together here and there... over blending is your enemy! 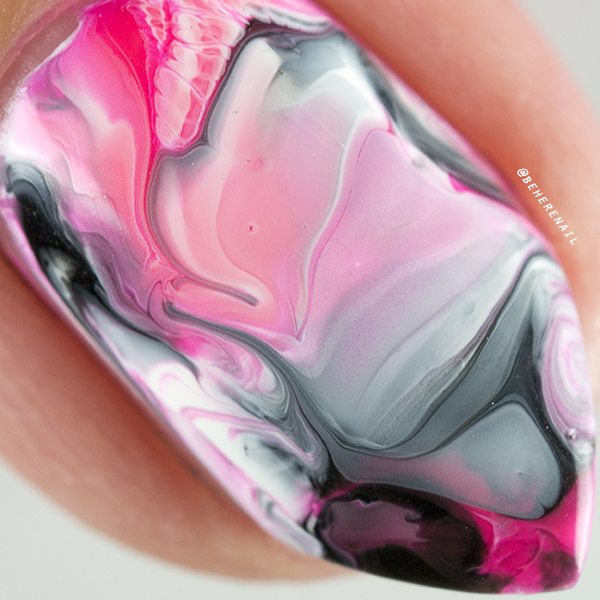 When you put your polish onto your stamper, use nice large "beads" of polish rather than painting it onto the stamper head. You need quite a bit to get full coverage with just a few dabs. I have found that the color I place onto the stamper last shows up the strongest in my smooshes, so you can keep that in mind to get a colorfully balanced smoosh. I always wear undies in the color that I think will help the smoosh pop. For this I used one coat of Sinful Colors Snow me White as the base. Generally I think a lighter base helps keep things bright because dark colors show up nicely over it as well as your lighter shades. If you put down a black base, your neon green might have trouble properly expressing itself. I hope this helps those of you trying to achieve a marbled smoosh! If you try this and you like the results, tag me so I can see! Now, it's traditional on Smooshy Nail Sunday to post your smooshy nails pre and post nail art, so I did some stamping over mine. I started with a smoosh of Sinful Colors Snow me White, Zoya Raven and INM Nails Bikini. 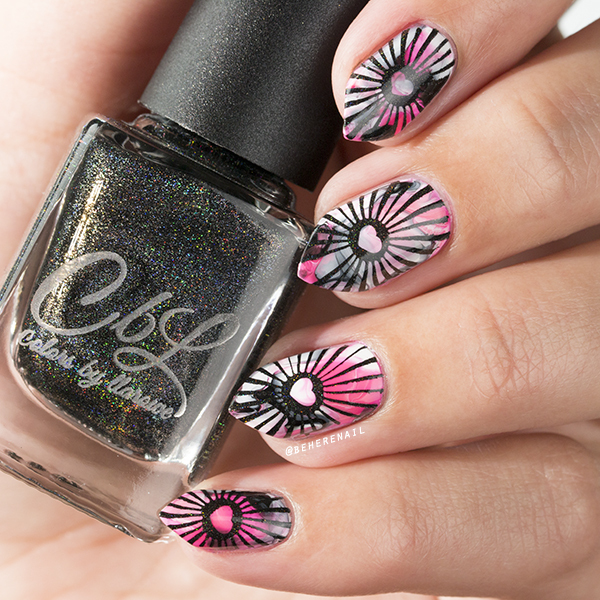 I used ÜberChic Beauty Collection 1 to stamp in Colors By Llarowe Panther. It's a crazy beautiful holo stamping polish from the line they just released. Yes I bought them all, but I was too ashamed to admit it on Instagram. I used my FabUrNails clear stamper to get the placement mostly right, still not good at this. And since Delia (@iamdeliasnails) implied I might be a perfect mani producing robot I let a defect in my stamping live, if you'll note the missing stripe on the middle finger! See you guys soon with more bloggy goodness! I'm hopelessly behind in viewing all your bloggy goodness....but I just had to re-visit this design again!! Drool!! Stop. Stepping. On. My. Hyacinths.